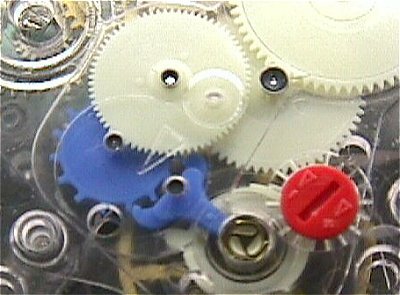 While digging through the junk box at my local watch materials supply house, I found a plastic bag containing two “el-cheapo” looking watch movements. My first reaction was “quartz junk”, but as I flung them back into the box, I glimpsed what looked like a balance wheel on one of them. 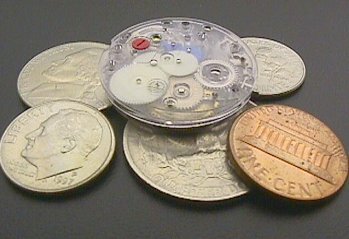 So extracting them back out, and being a little more careful this time, I took a closer look and was surprised to see what appeared to be a traditionally constructed Swiss mechanical watch, but made almost entirely of plastic. The sales counter staff knew nothing about them except they were made by Tissot about 30 years ago, but since no one could remember their calibre number, we could not find any info on them. Back at home, I did a search on the Internet, and much to my surprise, I discovered a Timezone article on these movements by Jack Freedman of Superior Watch Service Inc.. This is a “must-read”. Click Here to read Jack’s interesting historical perspective on this watch, and how it was the predecessor of the Swatch. Further research through my own library turned up a Tissot service bulletin on this movement, dated July 1973. 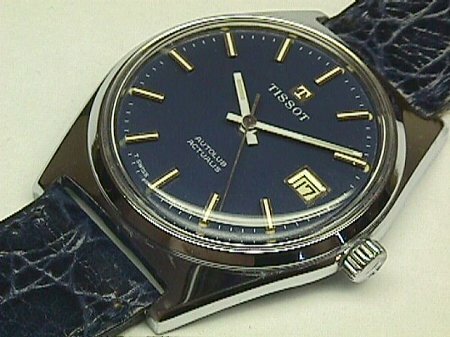 The Tissot cal. 2250, also known as the “Astrolon” or “Sytal”, (an acronym for “Systeme Total d’Autolubrification”) was produced in the early 1970’s. It was available in several variations, with and without calendar. 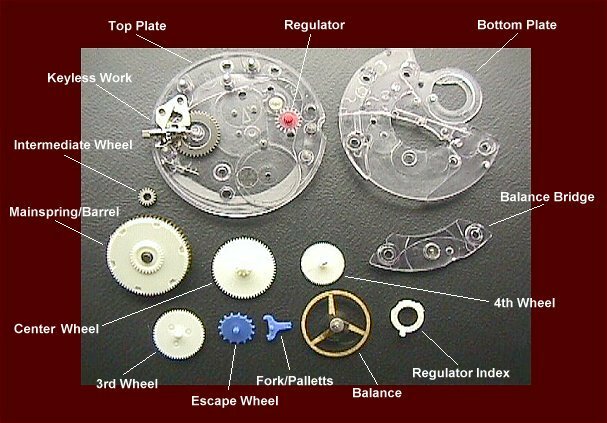 Though it is basically conventional in layout, it is markedly different from other mechanical watches in that most of its components are injection moulded plastic. It was semi-automatically assembled and required no lubrication at all. 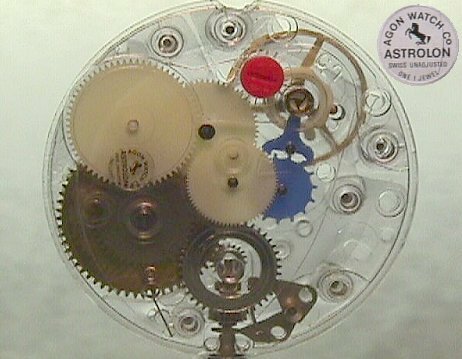 The parts count was reduced from 91 as found in a standard Swiss movement to 52 in the Astrolon, and no screws are employed at all. 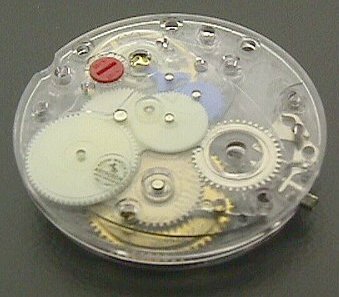 The only metal components are the balance assembly, the mainspring and barrel, and the keyless winding mechanism. The train wheels run either in the plastic plates or, mostly, on small metal plugs with fine spigots, pressed into the plates. A nice touch was to make the different components in different colors. Looking at the pic above, you might notice that the watch is of 3/4 plate construction, and it is unusual in that the dial side of the watch is the top plate, and the bottom (pillar) plate of the watch is the back. This is opposite to a normal watch. The movement has 1 jewel, used as the impulse pin. Of interest too, is that the minute and hour wheels are not driven by the center wheel, as in a normal watch, but are both driven directly by a wheel which is in friction contact with the barrel. As well as driving the hands, this wheel acts also as the setting clutch. The movement is 25.6mm dia., and 5.7mm high, or around 11 1/2 lignes. It is of 3/4 plate construction, with the plates held together by press-fit pins. Balance frequency is 2.5Hz, or 18000 vph. 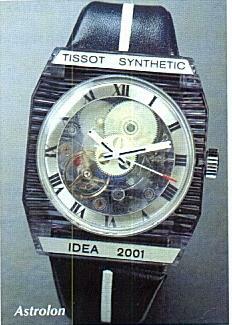 Tissot regarded the watch as mainly non-serviceable. However, their recommended service procedures allowed for replacement of the balance, winding stem, calendar work, and for adjusting the rate. The complete movement weighs an incredibly light 2.5 grams. 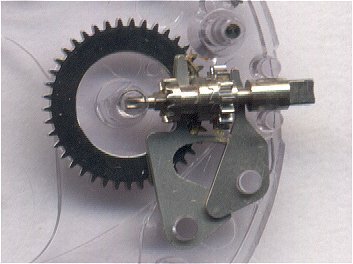 The escapement is a conventional in-line Swiss lever type, but with all parts made from plastic, excepting the impulse pin. This is synthetic ruby, and is the one-and-only jewel the movement contains. The balance is provided with shock protection. Tissot designed a special shock protection device for this watch. It is similar to the Incabloc system, but the balance pivot runs in a 1-piece molded bushing. This is centered in a conical metal carrier by a 3 armed spring, visible on the top of the bearing. The balance is gold-plated brass, very nicely polished on its visible surfaces, and has an Elinvar balance spring. The right combination of brass and Elinvar can give very good temperature stability, and is highly resistant to magnetic fields. The balance is poised, drill holes can be seen on the underside of the rim. The balance spring has no stud, and locates in a groove on the top plate, held in place by a small pin. Simple and very effective. Note also, the balance spring is positioned between the balance and the roller. Similar to what one would expect to see in any Swiss watch, though somewhat simplified. 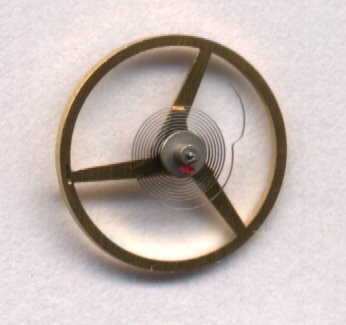 Uses a normal winding pinion and castle wheel, which provides a good feel when winding the watch. The Click is a simple spring finger which engages the Ratchet wheel. So how good is this watch movement? Average Beat error for all positions 0.7 milliseconds. As you can see, the performance looks very good, particularly in the 2 positions Crown Down and Dial Up (marked *). These are of most interest for wristwatches worn on the left hand, dial out, the most common wearing pattern. Not bad either, for a watch that has lain for 25 years in an unsealed plastic bag. These figures would have challenged any of the cheaper mechanical watches available in its day, and surely some of the better quality watches as well. Tissot had always been a innovator among the staid Swiss watch companies, and not afraid to experiment with unusual or exotic materials. Remember the Tissot “Rock Watch” and the “Wood Watch”? 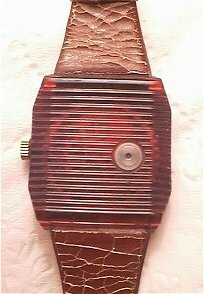 Well, the Astrolon plastic watch was no exception, and as Jack Freedman postulates, did not achieve the success it really deserved simply because of a lack of adequate marketing. Perhaps, too, it arrived just as quartz watches and cheap Japanese mechanicals were making an appearance, and this would have worked against its success. Even by today’s standards, where almost everything is made of plastic, the Astrolon stands out as a remarkable combination of precision plastics engineering and watch making. I wonder if any of these watches are still in service? Since this article was written, a few Timezoners have sent in pics of their watches, which can be seen below. Also, I have located a complete watch, which I have restored since it was in fairly poor condition. Click Here to see how the case was restored. 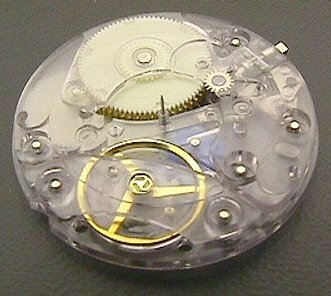 Apart from the case wear, the keyless mechanism on the movement had been damaged, due to the previous owner not understanding how to remove the snap-in stem and crown. So, I simply exchanged the movement for a NOS one I had, using the calendar parts from the original. Although this watch had seen lengthy active service, the original movement showed almost no signs of wear. Even under a microscope, the escapement looked perfect, and all the pivots looked unmarked. 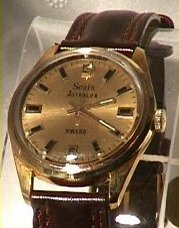 This is the watch just restored, containing the cal. 2270 movement. It runs well in service, not noticeably any different to a normal mechanical watch – perhaps even quieter than some mechanicals. On the timing machine, the watch runs -10 secs dial up and +8 secs crown down. However, it runs a steady 5 seconds a day fast for my normal wearing pattern, and this could easily be improved by regulating. 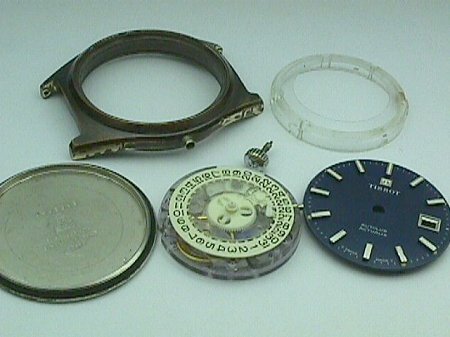 The main parts of the watch are the case (the chrome plating has been stripped off for re-plating), the plastic movement ring, the, plastic dial, the movement, snap-in stem and crown and the stainless steel back. The cal. 2270 movement, which is identical to the cal. 2250. It simply has the calendar parts added to the standard cal. 2250 movement, a total of 5 extra parts. 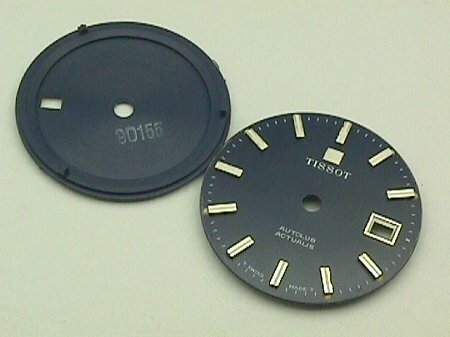 Tissot even succeeded in simplifying the calendar mechanism exceedingly well. 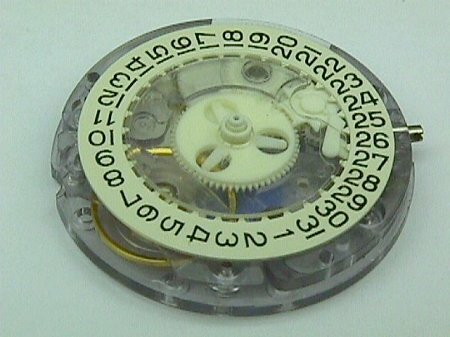 The dial is molded in 1 piece, including the markers and dial feet. The manufacturing of these dials would have been considerably simpler and cheaper than a conventional dial with applied markers. The stick-style markers, “T” logo and date window have been chrome plated. Luminous dots have been applied at the ends of the markers, and in the hands have also been filled. This is an example of an Astrolon sold by Sears in the 70’s. The movement is housed in a nice gold-plated metal case, with a display back. Watch owned and pictures supplied by Robert Barbarin. 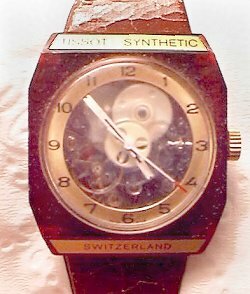 An almost fully synthetic Tissot Astrolon watch, with an unmistakable 70’s styling. The plastic has discolored a little, but otherwise it has stood the test of time. On the back, provision has been made to access the regulator. Watch owned and pictures supplied by John Hall-Mullen. 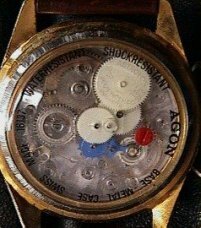 Sergio Lorenzon and Flvio Maia Pimenta both seperately sent in this old catalog pic of an Astrolon watch. Flvio says it’s from “Pulso” a Brazilian magazine. April 2 2000, Perth, Western Australia.